John Constantine can never be accused of standing still in one place for too long. At the helm of Vertigo’s longest-running series, Hellblazer, John's been to prison on several continents, vacationed in a dozen different planes of existence, died of cancer, stared down the devil and lived in a cardboard box. Most recently, he’s added a scarred brow, thumbless left hand and raven-haired bride to his collection of odds and ends. It’s business as usual for life to be unusual with Constantine, and this month’s self-contained yarn is just another inebriated step down that rocky path. My last on-again, off-again fling with this series came to a close before Peter Milligan’s run began in issue 250, and under his eye it seems to be moving and shaking once again. No stranger to the strange, Milligan has imbued the book with a sense of unease, historically-hinted mystery and ongoing forward momentum. The writer seems to have a clear vision for his series, but not one that he’s in a big hurry to press to the foreground. This month’s single issue story is a nice diversion, immersing John in familiar mists while keeping several longer-sighted threads stewing in the background. Though the primary story may be short, it’s also surprisingly rich and established, with a past that covers centuries and a moderately timely point at its heart. An under-appreciated veteran of the industry, Milligan’s still at the top of his game, quietly composing this short story with more depth than many of his contemporaries can manage with a six-issue arc. There’s a whole niche of artists employing a dirty, semi-serious style similar to that seen in Hellblazer #276, but Simon Bisley still manages to pull it off with a sense of legitimacy that’s lost on many of the imitators. Bisley’s artwork is constantly grappling with inner demons, warped and conflicted by some sort of terrible inner duality. It can’t settle on precision or embellishment, dark sarcasm or sick sincerity. Look closely and you can see his influence on everyone from Darick Robertson to Chris Bachalo, but I’ve yet to find another who can match his bizarre feel for unkempt menace and hopelessly chaotic order. That anarchic sensibility made him a good stylistic choice for Lobo, and it translates over nicely to the broad range of personalities evident in Constantine’s world, too. Bisley gives John himself the look of a man who’s been prematurely risen from a badly-needed rest, disgusted with the civilizations both above and below the Earth’s crust while still maintaining a sharp eye and a self-absorbed, bitter sense of humor. The land he walks has an unsettling character all its own, backed by the sensation that any shadow could be hiding something hairy and tentacled. It’s been a long time since this series has looked and felt so sincerely unnerving, and I can only hope Bisley sticks with it for a while. 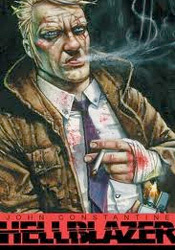 Hellblazer looks to be on another upswing, so fans and newcomers alike should take note. While John Constantine’s world may be a bit too rancid for mainstream readers, any fan of the long-standing Vertigo tradition of magic and dark hearts should really think about giving this one a look again. Milligan and Bisley have bottled a certain chemistry that could ultimately have them listed alongside the best the series has seen. Buy it.